Let’s listen to some Djaṯpaŋarri. It’s a kind of Yolŋu music and dance which, according to ethnomusicologist Dr. Alice M. Moyle, Gumatj clansman Dhambudjawa invented in the early to mid 20th century. The style was mostly popular with young men during Moyle’s visit in 1962-3, but as those men grew up, djaṯpaŋarri became popular with all ages. In short, it’s characterized by casual, often modern subjects, fun dances, and a more mellow and repetitive yidaki style than most Yolŋu ceremonial music. Because of that last factor, some inexperienced listeners mistake northeast Arnhem Land djaṯpaŋarri for western Arnhem Land music. Newer djaṯpaŋarri usually mentions, or seemingly addresses, young men by their SKIN NAME. This ‘Comic’ Djatpangarri sung by Minydjun (b. 1944) originated as the result of a Disney film cartoon seen by Yolngu people at one of the air bases during the Second World War. Donald Duck is the subject of the associated dance. The second and third versions below will be familiar to long time yidaki aficionados, but this first one is a rarity. Dr. Richard A. Waterman recorded Roy Ḏaḏayŋa (Rirratjiŋu clan) and Rrikin (Gumatj) singing ‘Comic’ with Djinini (Djambarrpuyŋu) on yidaki in 1952. Notice that Roy & Rrikin don’t sing anything other than the word “comic.” This stresses the importance of djaṯpaŋarri as a dance music. This isn’t the most intricate poetry you’ll ever hear. Here’s Galarrwuy with his late nephew Milkay Munuŋgurr on yidaki from the 1992 Yothu Yindi album Tribal Voice. Note that he’s got more of the style of Roy & Rrikin, with the sung yidaki part and short wordless notes. He however adds the skin name references often heard in djaṯpaŋarri songs. And of course, Milkay brings his “hard tongue” to the table. On Yothu Yindi’s hit Treaty also from Tribal Voice, they mix djaṯpaŋarri with pop & rock music. While you may have just known that bit as “the traditional part,” it’s not serious manikay you would hear in ceremony, but this simple, fun, public song. Listen carefully and you’ll hear that the second word you hear in the first Yolŋu language part around 0:50 is in fact djaṯpaŋarri. You’ll also hear the fragment djaṯpa a few times in the song. Mandawuy also sings a reference to a boy’s skin name and a call out to all the young men. 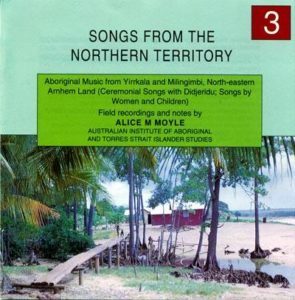 Note that you can find the second track above on the must-have landmark set of recordings Songs from the Northern Territory from the Australian Institute of Aboriginal and Torres Strait Islander Studies HERE. The 5-disc set contains an invaluable survey of music of the Top End from 1962-3, including lots of incredible didjeridu. 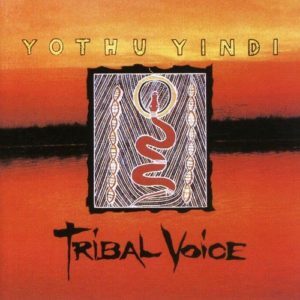 Yothu Yindi’s music doesn’t seem to be on iTunes and Amazon and CD’s are getting hard to come by. Search for used copies your favorite way. The first track above, from 1952, has never been commercially released. Last month, I gave you a mother lode of information about the Mulka Project’s Dhalinybuy CD. 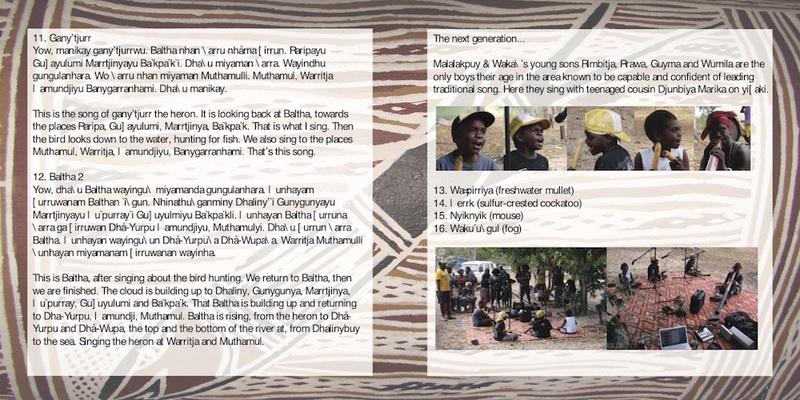 Documentation for the other titles I recorded wasn’t so far along when I suddenly had to leave Yirrkala, but I’ll provide you what I can to try and fulfill the original educational goal of these CDs. This month, Gurrumuru. We recorded at the Dhaḻwaŋu clan homeland of Gurrumuru on 28 September 2007. Once again, it was a road trip from Yirrkala with a stash of food, basic recording gear, the original young Mulka staff Ḏiṉḏirrk Munuŋgurr and Ṉuwaniny Burarrwaŋa and this time Buku-Ḻarrŋgay staff member Balwaltja Munuŋgurr, who wanted to see the process and visit family at Gurrumuru. Dhaḻwaŋu clan leaders Yumutjin and Warralka Wunuŋmurra sang while their gäthu, or nephew by non-Yolŋu thinking, Wambuna played yidaki (a yidaki you can hear more of HERE). We had one little mishap that day and the external hard drive used for the recording took a tumble. It seemed fine, but died completely shortly after the trip while I was trying to back it up. Fortunately, I already made a rough mix for the artists. That rough mix had to serve as the final mix. At least on this CD, there was no hard work to be done mixing it! From left, Wambuna, Yumutjin and Warralka Wunuŋmurra. 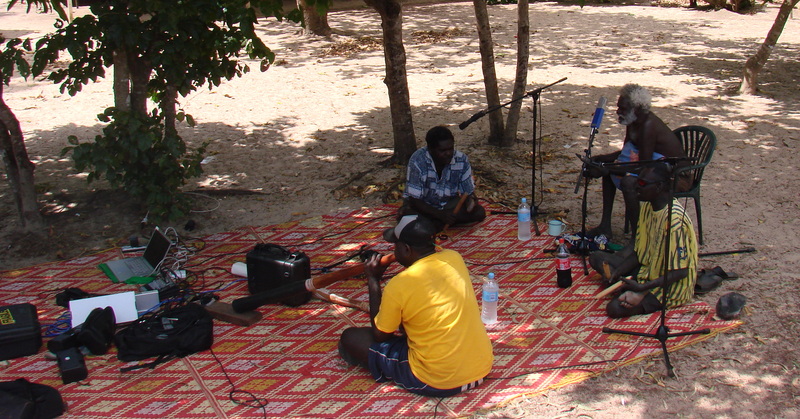 We recorded Yumutjin telling the story of the songs before I left Yirrkala, but we didn’t finish transcribing or translating it. My knowledge of the Dhaḻwaŋu Dhay’yi language and the high level ceremonial words Yumutjin used isn’t sufficient for me to do it on my own now. Instead of pestering some Yolŋu to help for free long distance, I’ll summarize as best I can. The songs tell of Birrinydji, or Ḻiya-Yiki, the knife warrior. Some say he was a Macassan, one of the sailors from modern day Sulawesi in Indonesia who came to Arnhem Land hundreds of years before Europeans arrived. Some say he was something else. Macassans didn’t normally venture as far inland as Gurrumuru. Maybe he was one of the Bayini, a group shrouded in myth who arrived before the Macassans. Maybe he was something else. Some historians believe Chinese sailors visited the Arnhem Land coast first. In either case, the songs of Gurrumuru and Birrinydji include introduced material culture such as knives, tobacco, playing cards, and rice. 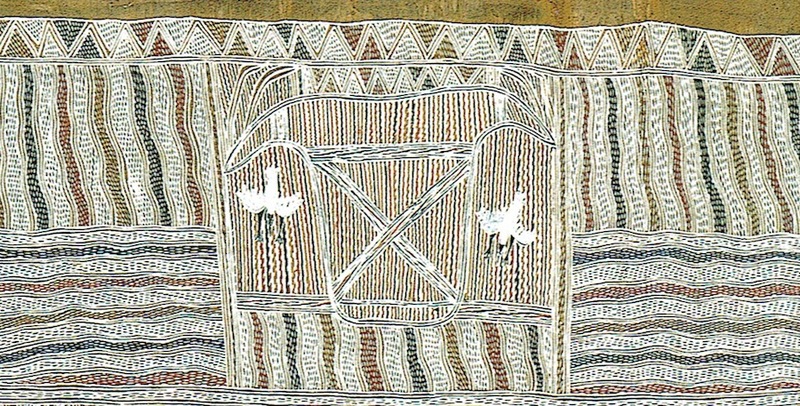 Bark painting by Yumutjin Wunuŋmurra. This is how we sing the land at Gurrumuru. 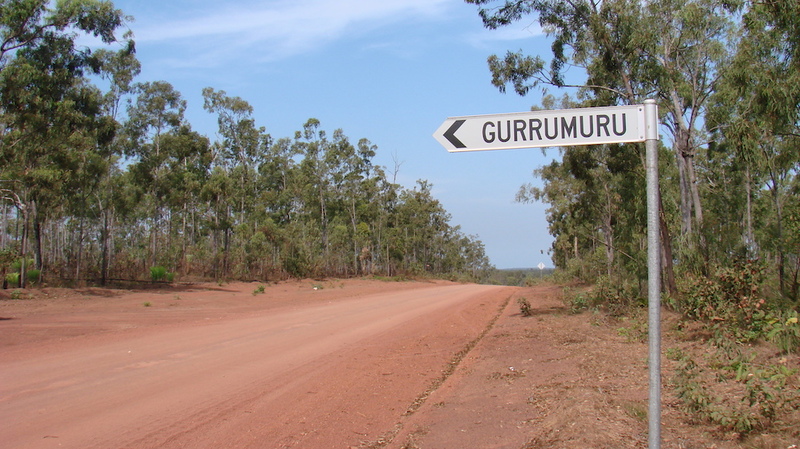 We sing of the warriors of the knife at Gurrumuru. Of the preparation of the place for the spirit we call Ḻiya-Yiki. They followed the path, came to this place and prepared the land, clearing the brush. Making the place clean. This is the place they and we belong. He spotted a special tree and went to sit in its shade to look over the clearing. He fell asleep and dreamed of the place. When he awoke, he smoked tobacco from his long pipe. It is a special smoke given to the people of Gurrumuru. Then he got up and began playing and singing. (YidakiStory side note: he plays the djoling, often translated either as ‘mouth harp’ or ‘flute’. I suspect it is not a coincidence that Indonesians have a bamboo flute called suling, and that Yolŋu don’t have an ‘s’ in their language). From there, he went to find money and started playing cards with the other men. There is tension among them. He goes and gets alcohol and drinks. As he gets drunk, he gets more wild. He gets his knife and begins an aggressive dance. The red calico flags of Gurrumuru are raised. Meanwhile, rice is being cooked. Some is stirred in the pot and some is tossed into the clearing. All the leftovers are thrown out to the clearing. The jungle fowl Djiḻawurr emerges, stamps its feet in the rice and calls out. It announces to other birds and by extension the humans that the north wind is coming, clearing the air and the land. As Djiḻawurr cries out, the sun sets, casting spectacular colours of red and yellow in the clouds. I’ve posted this several times before but here again is a video clip from near the end of the recording session. Much of Yumutjin’s telling included lists of ‘power names’ for places, people and objects. I don’t feel comfortable including them here without his oversight even though he recorded the statement for the public. I might get something wrong and the specific words don’t contribute much to the story for us outsiders, anyway. I don’t want to overstep any other bounds, but I’ll say that Djiḻawurr’s calls are often said to be announcements of death and the raising of flags is part of mortuary ceremony. It’s probably safe to assume that Birrinydji’s drunken aggression with his knife was his undoing, and that this story establishes Dhaḻwaŋu funeral practices. That’s all I’ll say about that. I hope this helps you appreciate that CD or download you’ve got a little bit more and gives you another small window of insight into Yolŋu culture. See also my post about the origins of the CD series HERE. Back in September, I wrote about The Mulkay Manikay Archives and promised to share more detailed information about the Dhalinybuy CD. Here we go! I’ve talked a lot about Dhalinybuy since this blog started last April, mostly in the series of posts about the short film Two Brothers at Galarra. The families of the late Mathuḻu Munyarryun embraced the creative potential of the Mulka Project’s new media facilities before other local Yolŋu. They pitched the first film idea outside of a workshop and recorded the first CD within a month of Mulka’s official launch. On 31 August 2007, I drove out to Dhalinybuy with Mulka’s first two employees, Ḏiṉḏirrk Munŋgurr and Ṉuwaniny Burarrwaŋa, some basic recording and filming equipment, and a bunch of food. We began with the senior singers, Malalakpuy and Wakaŋ, supervised and sometimes joined by Mathuḻu, along with the late Mirrwatŋa on yidaki. Listen to what happened from there on the CD, which is available from all the usual digital music retailers and from several yidaki sellers around the world. Here’s one sample. He only had to think for a few seconds. The title would be Baltha. Baltha, the Wangurri clan thundercloud which they sang at the beginning and end of the cycle we just recorded. He described the shape of it for me. He explained that they sang the journey of water from where we sat near the river Gularri to the sea, where it is sucked up by Baltha and rained down on the land to begin the journey again. They sing this cycle at funeral ceremony, the story of water paralleling the story of the human soul. The cover image would be a photograph of the cloud called Baltha. But I didn’t have to. Not long after the recording session, funeral ceremony was underway at Dhalinybuy. These ceremonies can last for weeks or even months. On 6 November, all of us at Yirrkala knew the funeral was wrapping up. My wife and I were out for a walk at sunset, looked in the direction of Dhalinybuy, and there it was. Baltha. Rising over the sea in Arnhem Bay. Possibly just as they were singing the end of this song cycle to conclude the ceremony. Balta, framed in green, the Wangurri clan’s colour. As I said in my prior blog post about the CD series, the late founding Mulka Project Director, Dr. Raymattja Marika, and I had big plans for the liner notes. We wanted to show up every outsider academic who published recordings of Aboriginal music. 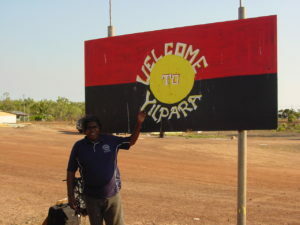 Dr. Marika sadly passed away suddenly before we finished the process on any of the three CDs we had recorded, then I suddenly had to leave Yirrkala due to my own family medical crisis. Those three CDs and several more in the end were released with simplified titles and no information other than track and artist names. I do have the recording and text of the late Mathuḻu telling the story as he wanted it in the liner notes, so will share those with you all now. The late Margaret Yunupiŋu and I did the basic transcription and translation, which was then polished with help from Dr. Marika and the late (wow, I have to say that a lot) Gulumbu Yunupiŋu. Tracks 1-7 on the final version are archival recordings, some of which are discussed thoroughly here. Ŋunha nhän ga dhäya mayali’ dharyundawu. Murrun nhän Ŋarru ga dharyun nhän ŋarru. Ŋunhan nhän ga mayali’ miyaman dhaŋuyam Baltha. That cloud standing there shows that rain is coming. There will be thunder and rain. These songs are about the cloud called Baltha. Yow, Baltha ŋunha nhän gayŋan ḏurruwan ŋarran Baltha, banha ga bunbuwanam nhän bala dharyuwanan. Dharyuwanan nhän bäŋnha bayman goḻurr. Bala nhän ŋarru dhuṉiyan garmak bayiwaḻiya dharyundawuy maḻwurrkkuŋ. Ŋunha murruyil’, manymak murruyil buṯthuwan ŋuymurru maḻurrkkuŋ dharyunda ŋuymurru nhanguru. Yow, dharyuwanan nhän buṯthuwanan djukdjukthuwanan bitjan bayiŋ yolŋuya. Ga bilinya dhuwanma dhäwu. The cloud Baltha is forming, rising up. It begins to rain on the cycad palm leaves and the ground of the valleys. The valleys and rivers begin to flood from the rain. Murruyil the pigeon flies through the rain to get away from the storm. It fled from the rain, soaking wet, like Yolŋu People would. That’s the story. Yow, ŋunha dharyuwan nhän ga manymak buṯthuwan murruyil’ dharyunda, dharyunda buṯthuwan murruyil’ djukdjukthuwan ga manymak after bayiwaḻiya murruyil’ŋuru nhän ŋätjin rirrakay’yuwan maypaḻ meṉḏuŋ yäku gunaminy. It was raining, the pigeon flies through the rain, soaking wet, and after that, the snail gunaminy cries out. Ga bayiwaḻiyam ga nhän buṯthuwan ŋerrk’nha ga ŋerrk’nha ḏurruwan ḏinguŋuru bäŋŋuru ŋayakandi dhopaṉŋuru. Nhän ḏurruwan ŋerrk, ŋarru wäyinma banha nhän wanhurr nininyŋu bawarraṉ ga dhaŋuya waŋganyma dhäwu. From there, the white cockatoo flies away from the cycad palms, where it lives. That’s one part of the story. Note: Mathuḻu originally named this section Bulmirri. another name for the grass that he used in his story. Yow, dhaŋu dhäwu banhaya dharyunda, dharyuwan nhän nhanam yuṯa dhawaṯthuwan ḏukitj muḻmu, wokara, nhän yindim yäku wokara, bulmirri. Nhän dhawaṯthuwan yuṯa djupaḻ dharpa gaṉakaṉa. Yuṯa dharyunda. Ḏukitj wulaynha dhawaṯthuwan. Wo ḏingu. Yuṯan ŋarran dhawayawaṯthuwan, ŋätjilim nhän guwaruwan ga banham nhän dharyuwanam nhän yuṯam dhawaṯthuwan. Muḻmu, dharpa banha yuṯan dhawaṯthuwan dhamany’tjuwan. Bilanya dhäwu. In this next part of the story, it rains, then the new shoots of grasses come out. The razor grass – the special name for that is wokara or bulmirri. Those two come out, the razor grass and the stringybark trees. New growth from the rain, the grasses come out. And the cycad palms. The old plants were burned, but when the rain comes, the new growth comes up. The new grasses and trees grow up. That’s the story. Note: Mathuḻu originally called this section Guḻarri after the specific water course, rather than Gapu, which is the general word for all water. Yow, dhaŋu manikay garmak bayikuwuy dharyunda dhaŋum garmak bayikuwuy dharyunda banhan nhän dharyuwan dhaŋu nhän ŋarru dhuniyan baḻaya wunhanha ŋuḻŋuḻyun ŋarru nhän dhuniya guryun djarrawuryun Guḻarri. This song is about the water from that rain, which comes down through the plants and becomes the rushing currents of the river Guḻarri in flood. Yow, dhuwanma nhän waripuyi nhän bilyuwan muḻkurr. Muḻkurr ga ŋäṉarr. Ga garmak ŋarru nhän betjdjinan garmak, dhuniyanan. Betjna garmak ṉikundayinan ḻiŋgun. Dhuwaniyan garmak. Yow, waŋganydji yulŋum, ŋätjilim nhän biḻma, bala ḏirruwan waŋgalalin ga dhuwanmanam dhä-wupalin ḏirruwan gayawak mayali’ nhan manikay. Now we are turning our minds to another part of the story. Our minds and our tongues. The water is calming, becoming more still as it flows down river. This water (Guḻarri) has become calm. It is all the same thing, the same old song, but as it returns to our country where the fresh and salt waters meet, the melody changes. Man’tjarr, miyaman man’tjarr. Man’tjarr wokundurr gulam ŋarram dhaḻaḻyun. Ŋunhayam manikay ŋandjaḻa’yuwan djupal. Bilanya. Leaves, singing the leaves. The leaves, branches and grasses washed out by the storm are flowing down the river. The singers turned the song around to this. Barramundi, this manikay. Balin. Ratjuk manikay ŋarru yindin. Riŋgitjin nhana rakaram dhäyanhara dhawurrḻi. Djuṉmili nhän ḏam’thun gayŋa guwaman man’tjarr ḏuniyanhara. Biyapul Guḻarri wambal guwaman. Djaykurrŋa Guyuwuruyu. Banatja nhän dham. Ŋayawuḻuḻ Biruyuwanan nhän dhurrwaram. Ga ratjuk bawalamiyu bayiŋ guwaman ratjuk bilinya bitjan ŋuykal. This song is about the barramundi, we call Balin or Ratjuk. This is the very sacred song for barramundi. The faster clapsticks signify that we have reached where all the leaves and plant material washed downstream by the storm have gathered up in the still water. The barramundi is biting at the leaves and drinking the water of the bottom of the river. The mouth of the barramundi in the water called Djakurrŋa Guyuwuruyu. Ŋayawuḻuḻ, Biruyuwanan are important names for the barramundi’s mouth. Everyone eats the barramundi, just like the kingfish. Yow, waṯpirriya manikay. Waṯpirriya manikay baya nhän bayiŋ ŋoya, buryun. Dhawurrŋa djuṉmiliŋa nhän bayiŋ ŋoya. Ga bulu nhän bayiŋ makaŋa, gunydjakŋa ŋoya waṯpirriya nhanbayi, dhuwaniya manikay. This is the song of the freshwater mullet waṯpirriya. The song of where waṯpirriya lie, splashing in the water. Where the leaves and branches are bunched up. Lying at the roots of the Yirritja pandanus. That is this song. Part of the original liner notes draft integrating Wangurri clan art related to the text. Note: Mathuḻu used another name for the heron, Gany’tjurr. Which incidentally, is one of my given Yolŋu names. Yow, manikay gany’tjurrwu. Gany’tjurr Baltha nhän ŋarru nhäma ḏirrun. Raripayu Guṉuyulumi Marrtjinyayu Baḻkpaḻkḻi. Dhaŋu miyaman ŋarra. Wayindhu gungulanhara. Wo ŋarru nhan miyaman Muthamulli. Muthamul, Warritja Ŋamundjiyu Banygarranhami. Dhaŋu manikay. This is the song of gany’tjurr the heron. It is looking back at Baltha, towards the places Raripa, Guṉuyulumi, Marrtjinya, Baḻkpaḻk. That is what I sing. Then the bird looks down to the water, hunting for fish. We also sing to the places Muthamul, Warritja, Ŋamundjiyu, Banygarranhami. That’s this song. Yow, dhaŋu Baltha wayinguŋ miyamanda gungulanhara. Ŋunhayam ḏurruwanam Balthan ḻiŋgun. Nhinathuŋganminy Dhaliny’ḻi Gunygunyayu Marrtjinyayu Ŋuḻpurrayḻi Guṉuyulmiyu Baḻkpaḻkli. Ŋunhayan Baltha ḏurruna ŋarra ga ḏirruwan Dhä-Yurpu Ŋamundjiyu, Muthamulyi. Dhaŋu ḏurrun ŋarra Baltha. Ŋunhayan wayinguŋun Dhä-Yurpu Dhä-Wupaŋa. Warritja Muthamulli ŋunhayan miyamanam ḏirruwanan wayinha. This is Baltha, after singing about the bird hunting. We return to Baltha, then we are finished. The cloud is building up to Dhaliny, Gunygunya, Marrtjinya, Ŋuḻpurray, Guṉuyulumi and Baḻkpaḻk. That Baltha is building up and returning to Dha-Yurpu, Ŋamundji, Muthamul. Baltha is rising. From the heron to Dhä-Yurpu and Dhä-Wupa, the top and the bottom of the river. Singing the heron at Warritja and Muthamul. There was meant to be more written to flesh out the context, but this has been what the senior man of the family wanted to tell all of you out in the world about what was happening in the songs. I hope that if you have the album, this brings you some new appreciation of it. If you haven’t bought it, I hope you do. A draft of the tray card, featuring the river Gularri next to Dhalinybuy – the water course we travel down throughout this song cycle. 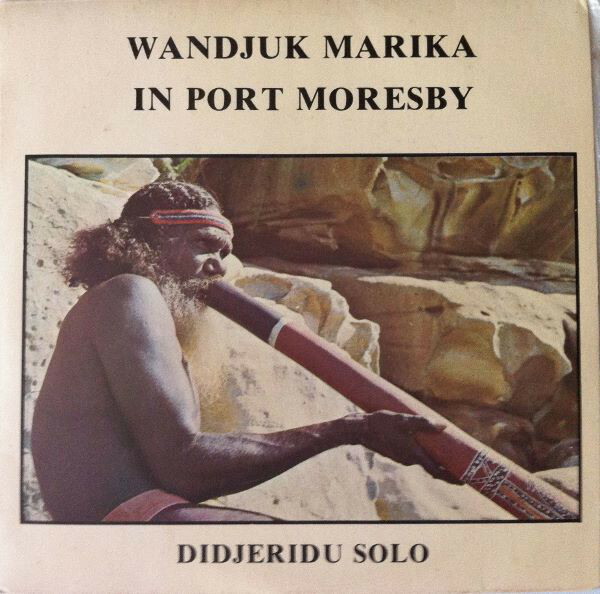 It seems odd, but yes, 1977 saw the release of a 7″ record featuring the late great Rirratjiŋu clan leader Wandjuk Marika playing solo yidaki. (a) Dangultji (Ḏaŋgultji) – the Brolga. A secular camp dance in which the performers, particularly children, imitate the behaviour of the brolga. (b) Malwiyi (Maḻwiya) – the Emu. A camp dance about the emu, Australia’s largest bird. It is flightless and may grow to 1.8 m in height. The Aborigines hunt them for food and relish their large green eggs. 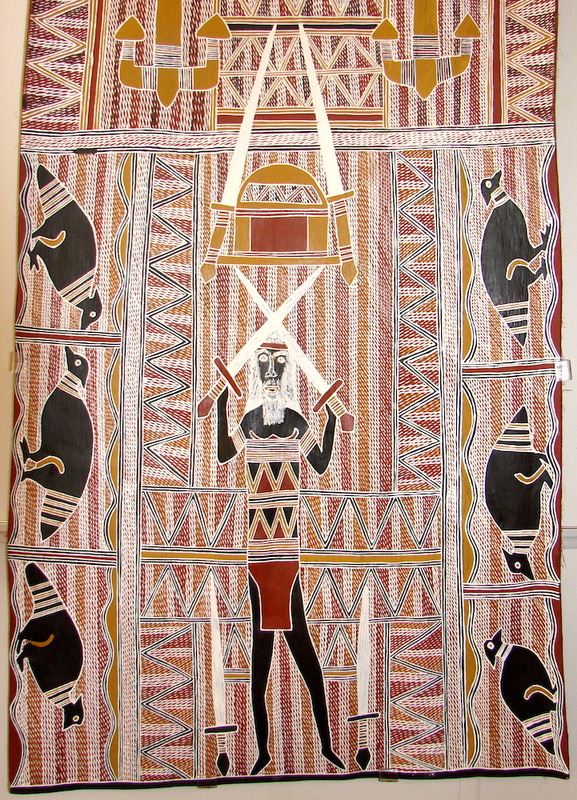 (c) The Wawilak (Wäwilak) Story – The Wawilak myth gives rise to a most important cycle of ceremonies in North East Arnhem Land. In the Dreamtime the two Wawilak sisters, one of them pregnant, travelled over the land and finally came to rest by a lagoon where they built a shade for the birth. One of the sisters was gathering paperbark when she accidentally polluted the pool wherein dwelt the Lightning Serpent, a huge snake which could reach from the heavens to the earth. In a fury he sent a black cloud overhead, and torrential rain. The sisters cried out and danced to appease him but it was to no avail, and he swallowed them. The Wawilak sisters are the Creation Sisters – they gave rise to the present Aboriginal population. (I) The first solo accompanies the Wawilak song which tells of the girls’ travels before they reached the pool. (II) The second solo accompanies the Wawilak song which tells of the torrential rain sent by the Lightning Serpent. (a) The Wawilak Story (from side one). (III) Djuwan – This accompaniment tells of the time after the Dreamtime, when the children of the Creation Sisters return to the sacred waters where the Serpent Lives and re-enact, in ceremony, the original events. The song and didjeridu accompaniment are used in mortuary and age-grading ceremonies. (b) Kadabana (Gatapaŋa) – the Buffalo. Buffalos brought by early European settlers have run wild in the swamps and plains of Arnhem Land. This is a camp dance which describes the heavy animal crashing through the undergrowth being hunted by Aboriginal men for food. (IV) The clouds – this segment accompanies the song which tells of the rain, and dark cloud which the Lightning Serpent sent overhead. (d) Katjambal (Garrtjambal) – the Kangaroo. The story of the kangaroo as he bounds along the grassy plains through the scrub. 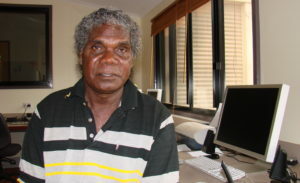 Wandjuk Marika is a ceremonial leader of the Riratjingu (Rirratjiŋu) clan of North East Arnhem Land and Chairman of the Aboriginal Arts Board of the Australia Council. He was born about 1930 om what was then the small mission settlement of Yirrkala. This has since become the focal point of one of the most important struggles for ownership of land by traditional Aborigines, and the site of the huge bauxite mine, Nabalco. Wandjuk Marika and his people have been catapulted into confrontation with an industrialised society and in the process they have emerged with a great degree of strength and political and social cohesion. Traditional culture remains a vital part of life in Eastern Arnhem Land, the stories of the exploits of the ancestral beings of the Dreamtime such as the Djanggawul (Djaŋ’kawu) and the Wawilak Sisters providing the basis for lengthy ceremonial cycles involving ritual and social obligations covering every aspect of life from birth to death. 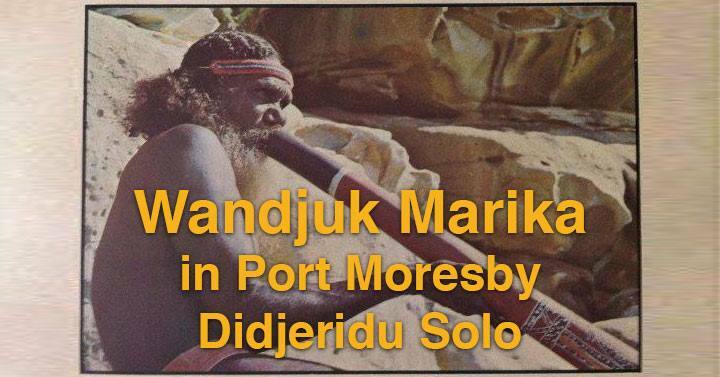 Wandjuk Marika learnt to play the didjeridu as a small boy from his father, Mawalan, who was a great and respected ceremonial leader, and who passed on to Wandjuk his knowledge of the sacred lore, the ceremonies and the sacred designs, just as Wandjuk is training his own sons today. As well as his role in the traditional life of the Riratjingu, Wandjuk is also striving to explain the stories and create an awareness of the depth of his own culture in all Australians, through his work on the Australian Aboriginal Arts Board. 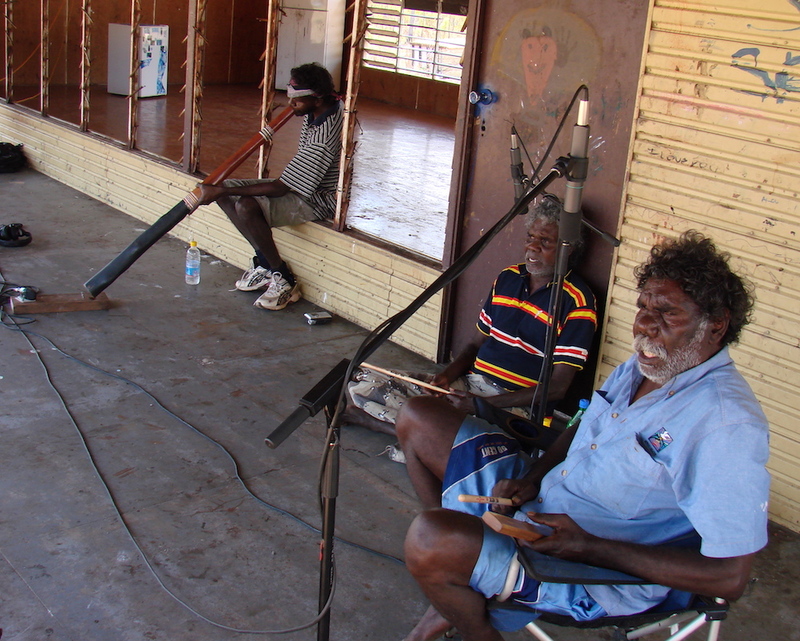 The didjeridu, or drone pipe, is the traditional wind instrument of the Aborigines of Northern Australia. It is in fact a branch or trunk of a young eucalyptus, or string bark tree which has been hollowed out by termites. The musician taps the tree to see if the resonance indicates it is sufficiently hollow, and then after he cuts it down, he selects a suitable length for the instrument. This is smoothed and painted, and bees wax or gum is applied to the end to be placed in the mouth. This narrows the diameter of the interior hole, and provides a comfortable mouthpiece. The length and diameter of the instrument determine its pitch and the tone produced when it is blown with loosely vibrating lips. Variations in the sound produced occur when the lips are tightened, or when the tongue is moved towards and away from the opening. The vocal chords are also used when producing a croak. The sustained rhythm is achieved by a unique form of breathing. Air is drawn in through the nose in quick breaths. This is retained in the cheeks and continuously expelled through the mouth to maintain the sound. The instrument is generally played as a rhythmic accompaniment to the songman and clapsticks, however, it is also played solo for camp dances and general fun and amusement. 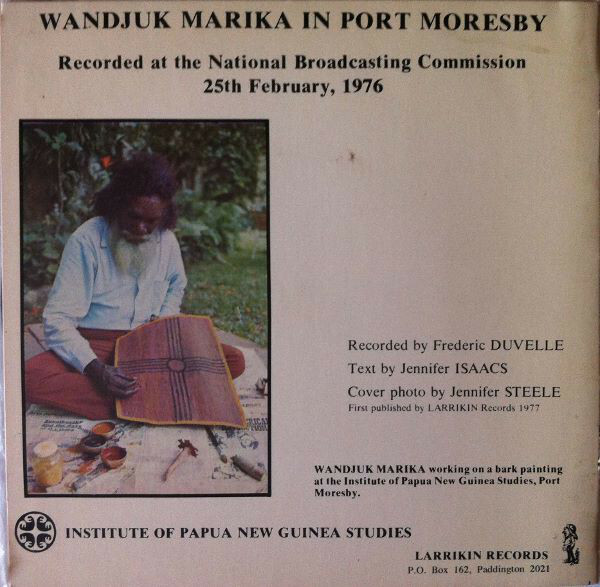 Wandjuk Marika was invited to be a guest lecturer at the Seminar on Art in the Third World at the University of Papua New Guinea in 1976, organised by the Institute of Papua New Guinea Studies. Wandjuk Marika gave a lecture on Aboriginal art and music, together with a performance on the didjeridu. In addition he demonstrated the art of bark painting and opened an exhibition of Aboriginal art at the Institute of Papua New Guinea Studies. Thanks to John of manikay.com for first making me aware of this recording many years ago. Images borrowed from discogs.com. No, I do not have rights to this recording or text. But it’s long out of print, most likely never will be reprinted, and I know many of Wanjduk’s living family and bet they’d be happy to let this recording be heard as long as nobody’s selling it for a profit without them. Yes, you’re hearing right. “Mudpo” is making a little nasal squeak sound on top of normal yidaki technique. 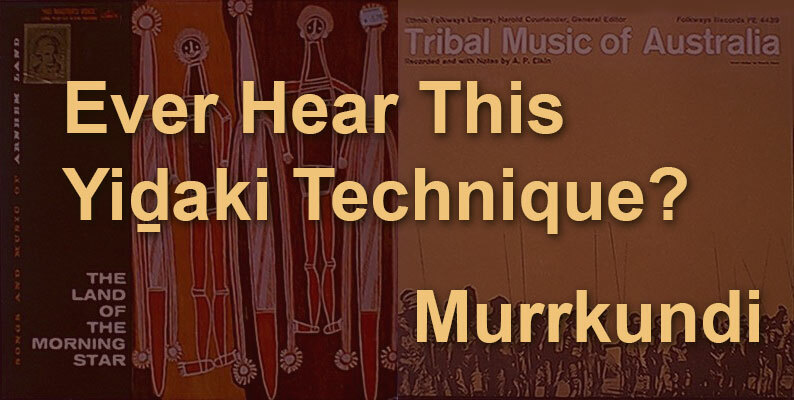 A. P. Elkin caught a more extreme, squeakier version of the technique for his 1953 recording Tribal Music of Australia. “Puller” was a term used for didjeridu players by many anthropologists and presumably northern Aboriginal People in the 1950s and 60s, but the term has fallen out of use. 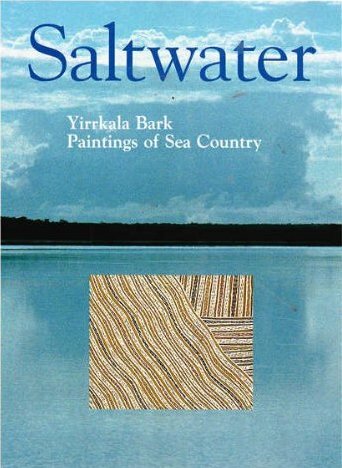 I didn’t make a study of the term while I lived in Yirrkala, but the few young Yolŋu I asked about the word looked at me like I was crazy. Unfortunately, neither Holmes nor Elkin recorded the full song so that we could hear this technique in context, nor did they detail what clan(s) sing it. I never put much time into the issue, but asked some Yolŋu about “murrkundi.” Only a few older yidaki specialists, Djalu’ Gurruwiwi and the recently deceased Datjirri #1 Wunuŋmurra, said they were familiar with the technique. Both had health conditions that made the sound more difficult for them to produce, but gave me a brief demo. Unfortunately, neither were keen to have it filmed. So you just get a quick clip of me. If anybody out there has more information on this subject, please let me know and I’ll post an update. 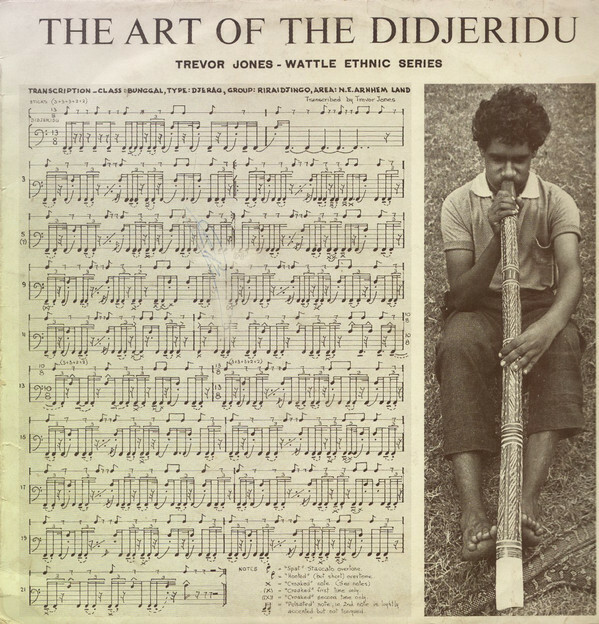 Trevor A. Jones must be one of the first academics to take a serious interest in the didjeridu, including learning the instrument himself. He published several papers on the subject, but we’re talking here about recordings. 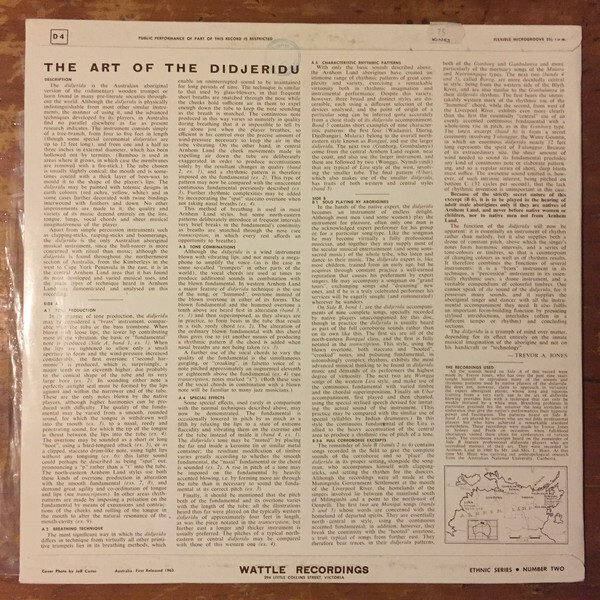 In 1963, he produced ‘The Art of the Didjeridu’ for Wattle Records. 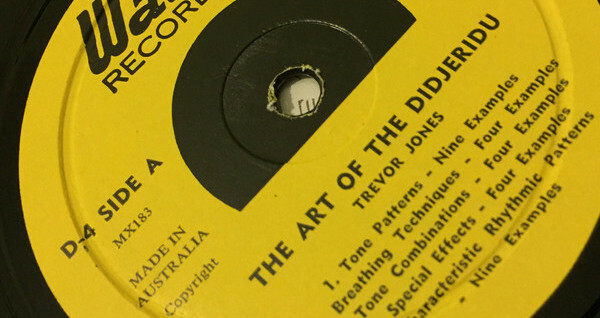 It features Jones demonstrating basic technique, some solo recordings he made of Arnhem Land players, and field recordings Lester and Betty Hiatt made in 1960 in and around Maningrida, north central Arnhem Land. It’s a unique release from the very early days of didjeridu recordings. 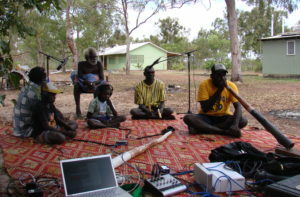 A demonstration of basic technique by a non-Aboriginal player and samples of the instrument in context. Album cover. Pic from discogs.com. Following are excerpts from the original liner notes. I haven’t edited the spellings or added any interpretive notes based on my later experience in Arnhem Land… although it’s pretty tempting. All the sounds heard on Side A of this record were made by Trevor Jones, who has over the past nine years taught himself to reproduce many of the sounds and rhythmic patterns used by native players of the didjeridu. He does not, however, claim to approach in virtuosity the expert aboriginal player, whose long and rigorous training from a very early age in the art of Didjeridu blowing provides him the technique that can only be weakly imitated by a white man. Breathing problems in particular preclude for the amateur the long stretches of endurance that give the native’s performances their hypnotic power and fascination. The patterns heard on Side B. band 1 (yidakistory note: our Track 06), are played by natives who are not fully professional players but who have achieved a remarkable standard nonetheless. These recordings were made by Trevor Jones in Sydney and Perth on occasions when full-blooded aborigines visited those cities for conferences of various kinds. The corroboree excerpts heard on the remainder of Side B feature professional didjeridu players who are accredited masters of their art. They were recorded in Arnhem Land in 1960 by Mr. and Mrs L. Hiatt. At that time Mr. Hiatt was carrying out anthropological research from the Australian National University, Canberra. Back of the record sleeve. Pic from discogs.com. Didjeridu by Trevor Jones. Short examples of nine characteristic patterns: the first four (Wadamiri, Djerag, Djedbangari, Mulara) belong to the overall north-eastern style known as Bunggal, and use the larger didjeridu. The next two (Gunborg, Gunbalanya) come from the central Arnhem Land region, near the coast, and also use the larger instrument, and these are followed by two (Wongga, Nyindi-yindi) that are typical of Lira style of the west, involving the smaller tube. The final pattern (Ubar) which also makes use of the smaller didjeridu, has traits of both western and central styles. Recorded by Trevor Jones in Sydney and Perth of non-fully professional players who visited these cities for conferences of various kinds. First six solos are of the north-eastern Bunggal class using the blown overtone, both staccato and “hooted”, croaked notes, and pulsating fundamental. The next two songs are Wongga songs of the western Lira style, and make use of the continuous fundamental with varied timbre and the chordal superimposition. Finally an Ubar accompaniment, first played and then chanted, using the special stylised speech devised for imitating the actual sound of the instrument. 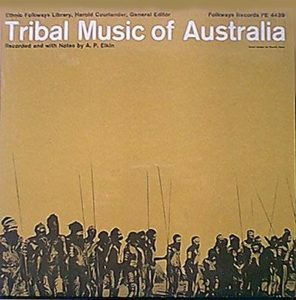 Recorded by Lester & Betty Hiatt, Arnhem Land 1960. Manigai, essentially north-central in style, using the continuous accented fundamental; in addition, however, they break the continuity with the “hooted” overtone, a trait typical of songs from further east. They therefore bear traces, in their didjeridu patterns, both of the Gunborg and Gunbalanya and more particularly of the mortuary songs of the Mulara and Ngorunngapa types. 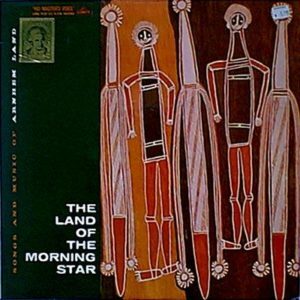 Recorded by Lester & Betty Hiatt, Arnhem Land 1960. Borog song, more decidedly central in style, being from the western side of the Blyth River, and are also similar to the Gunbalanya in their didjeridu rhythms. This one bears the unmistakable western mark of the rhythmic use of the “hummed” chord. Recorded by Lester & Betty Hiatt, Arnhem Land 1960. This one is from the west of the Liverpool River and exhibits even more clearly than the previous, the essentially “central” use of an evenly accented continuous fundamental with whole-tone rise in pitch, as in the Gunborg type. YidakiStory.com takes over: Sorry, I’m not going to include this track. Aboriginal People shared many things with early anthropologists that they choose not to share publicly now. They did not understand the implications of sharing with these (mostly) men who would then publish the material for countless others to see. I never played this track publicly when I lived in Yirrkala, so I won’t put it out publicly on the internet. It contains song and didjeridu from what is considered to by “inside ceremony” belonging to specific clans. It would not be shared with neighbouring Aboriginal People who were not initiated into the given ceremonial business, let alone a non-Aboriginal public. OK, there you go. A quick look and listen of a historic didjeridu recording you may not have heard. I’ll bring you some more old tracks in the future.